Famous Azerbaijani artist Sakit Mamedov’s works are being presented at the Louvre Museum within an international exhibition of paintings called "Carrusel du Louvre" since June 17. 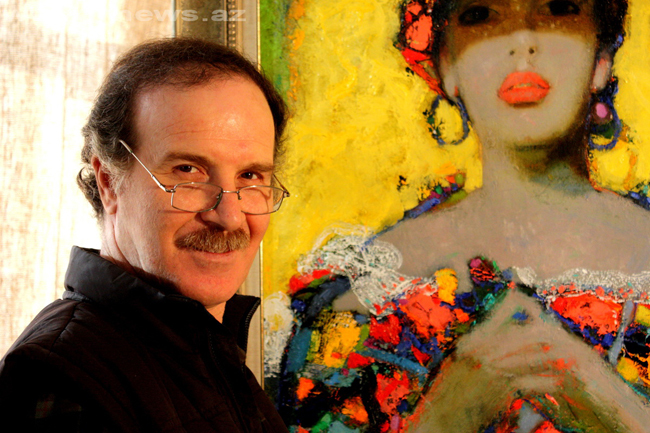 Sakit Mammadov, who is an Honored Artist of Azerbaijan, member of the Artist Union, Russian Imperial Academy of Arts’ Honorary Academician, winner of the Golden Order "Son of the Fatherland", the award "Dada Gorgud", Leonardo da Vinci Medal, the Order of "Honor of Europe", a prestigious Russian prize "Man of the Millennium", Academician of the European Natural Sciences Academy, was awarded by the European Academy of Natural Sciences during the exhibition. He was awarded for his enormous contributions to the world culture. His paintings "Offended angel", "Heritage", "Unison", "Clowns on holiday", as well as interesting works of students, electronic catalogs in flash format, animated paintings, paintings with 3D effect aroused great public interest. Sakit Mamedov was born on August 5, 1958, in the city of Neftchala, Azerbaijan. The biography of the Azerbaijani artist is included into the Encyclopedia 'People of our millennium' which is released with the support of the Presidential Administration of Russia, Federation Council, State Duma, UN and UNESCO information center, Interfax-Azerbaijan reports.